Philipsburg (Montana), June 16, 2014: Now that several weeks have passed since the most severe flooding in the recorded history of the Western Balkans, a clearer picture of the events that transpired and their ongoing repercussions is available. Several topics of interest that have emerged in the weeks since the flooding are touched upon here, including the indifference of Western media and governments, media censorship, and the transcendence of common humanity over ethnic divides in flood stricken areas. In May, a cyclone named “Tamara” slammed the Balkans, leading to a staggering amount of rain across the region. 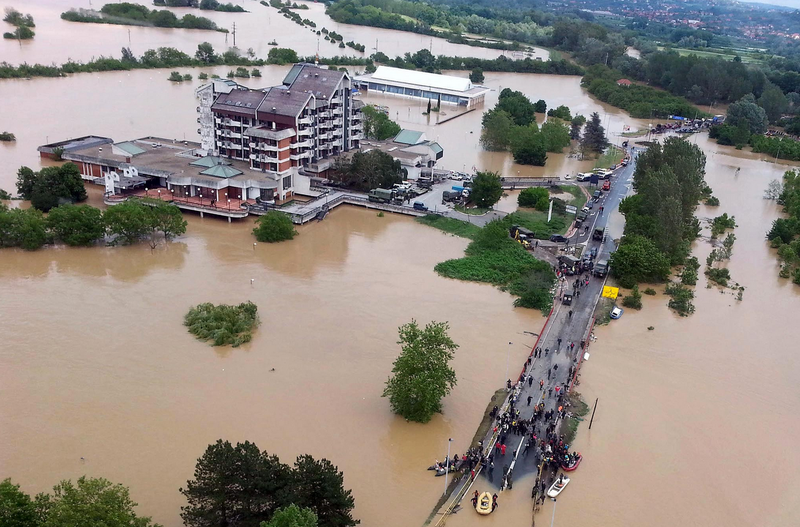 Subsequently, major rivers and their tributaries burst their banks leading to entire cities, such as Obrenovac in Serbia, being entirely submerged. The deluge also triggered hundreds of landslides across the region, causing further destruction and disturbing numerous fields of landmines from the wars of the 1990’s. Preliminary assessments of the destruction indicate that at least 71 people lost their lives, millions are adversely affected and over one hundred thousand buildings have been destroyed across Bosnia, Serbia and Croatia. Overall, it is projected that the damage costs left in Tamara’s wake will exceed the combined cost of the devastating wars which fragmented the former Yugoslavia. To their credit, Russia, Germany and Austria were quick to offer assistance to this grievously stricken region of the world. Others, however, including most notably the United States, have been slow to offer any meaningful assistance. Assistance aside, mentions of the disaster in the American media have been nearly nonexistent in both television and major online sources. During the peak of the flooding, the effects of the scant coverage were easily noticeable in my own network of close friends back in Montana. Nearly all of them were unaware of the flooding – a remarkable fact considering that most of these individuals are people I would consider ‘well informed’ generally. So, what does this high degree of ambivalence on behalf of America and the West suggest? Frankly put, it is indicative of an ongoing trend of withdrawal from and desertion of the region. Aside from courting Montenegro as a future NATO partner, the West – and especially the US – have swept the “little countries” of the former Yugoslavia under the rug, most damningly in dysfunctional and poverty stricken Bosnia & Herzegovina (BiH) where the Western drafted Dayton Accords remain the law of the land and have undoubtedly contributed the abysmal degree of progress over the past twenty-plus years. What is more, due to the residual effects of the media campaign that hyper-stereotyped the various peoples of the former Yugoslavia and its successor states during wars of the nineties, there is virtually no hope for an upsurge in popular demand among Western citizens for their governments to be more proactive in aiding flood-stricken countries. This, combined with the reality that, as each day goes by, the floods are becoming even more inconsequential in the minds of Western officials and citizens makes the prospect of an adequate relief effort all the more improbable. Simply put, the West has failed the Balkans….again. It is commonly held that the occurrence of a natural disaster provides an opportunity to measure the level of preparedness and overall aptitude of a state. Depending upon whether or not citizens regard the state’s response as satisfactory or not, the state will either be held in very high regard or, on the other hand, in bitter distrust. Unfortunately – if not predictably – the governments of Serbia and BiH have responded to the recent flooding in lackluster fashion. It is worth noting that Serbia, whose centralized unitary government is generally considered to be more functional than Bosnia’s, did not respond to the flooding in a significantly better manner. Though difficult to draw conclusions, this fact does seem to suggest that, at least in the occurrence of natural disaster, Bosnia’s decentralized federal system is no more ill-equipped than its neighbors. In fact, although both Serbia and Bosnia have been accused of being slow to react, especially in their failure to issue proper warnings, only Serbia’s leaders have shifted nearly the entire blame onto its own citizens. Furthermore, Serbia’s misconduct did not stop at its own inaction and failure to shoulder responsibility. In the weeks following the deluge, allegations quickly surfaced, including from the Organization for Security and Cooperation in Europe (OSCE), that the Serbian government was censoring websites that had published material critical of the states conduct concerning the flooding. The Serbian government has officially denied these allegations. Although the extent to which these allegations are true remains to be verified, any, let alone widespread, censorship by Serbian Prime Minister Aleksandar Vučić’s government will only serve to further degrade trust among Serbian citizens, tarnish Serbia’s international reputation, and hamper the country’s EU ambitions. Rather than blame its own citizens and accuse the OSCE of lying and “attacking Serbia”, the Serbian regime would be much better off to silence criticism by constructive action, such as by boosting avenues toward freedom of expression, adding further transparency to flood relief efforts and striving to do the best by its own citizens while attempting to keep the need for international flood relief assistance a salient issue. Unfortunately, however, it is likely that these things will not occur and that a blame game mixed with a narrative of victimhood will persist instead – or, “politics as usual” in the Western Balkans. Though the flooding has caused unfathomable destruction, tragic loss of life, and a full display of government mishandling, this otherwise horrible event has also shown us that people in the Balkans are willing and able to work together across jurisdictional and ethnic divides. Nowhere was this solidarity through common humanity on more beautiful display than in Bosnia – the same Bosnia whose politicians across both entities (Republika Srpska and the Federation) are seemingly more intent on augmenting ethnic divisions than working toward the betterment of their country. In Doboj, for example, a predominantly ethnic Serb village in Bosnia’s Republika Srpska, the flood ravaged population received the most help from neighboring Tesanj, a town within the Federation. Whether or not the solidarity between the various peoples and states within the region engendered by these most recent floods will become a fixture over the long term remains to be seen. In Bosnia specifically, the upsurge in civic unity may serve to reignite the citizens’ plenum social movement. The aforementioned movement reached fever pitch, resulting in mass demonstrations against government corruption and incompetence this past February but lost considerable momentum over the course of the following months. Speculation regarding the future political ramifications of the flooding aside, it was refreshing to to be reminded that ordinary citizens are capable of transcending the petty divisions and squabbling expounded by politicians, though it is unfortunate that it requires a natural disaster for such an opportunity to manifest. 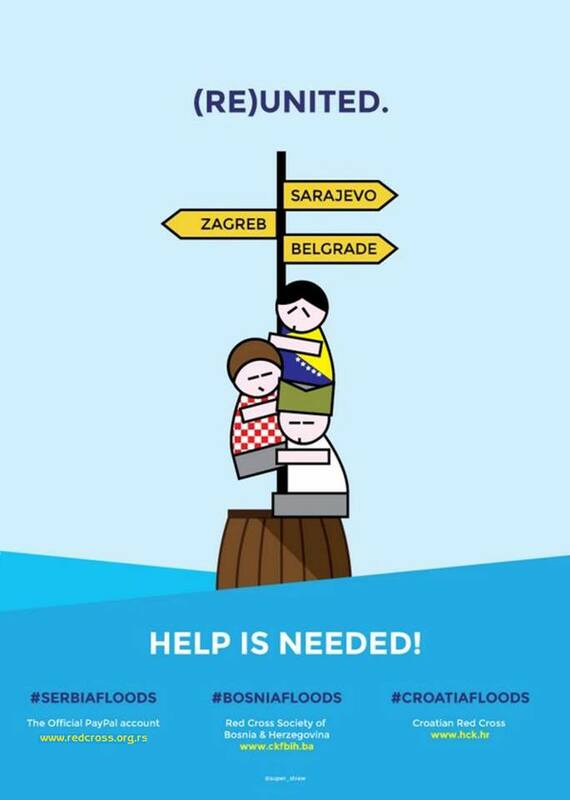 As a final note, I strongly encourage everyone who is willing to do so to donate to flood relief organizations within Bosnia and Serbia. For those who desire to avoid giving to the governments, recommended organizations include the Red Cross branches within each of the countries (links below).